You can travel to Gargano in many ways. 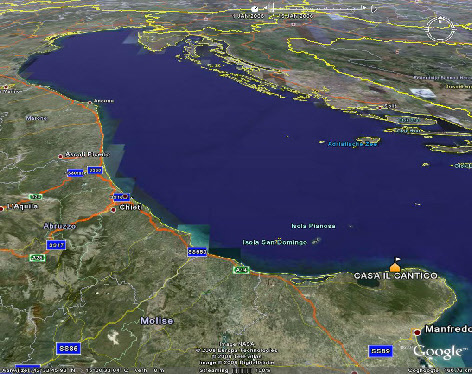 Quitly traveling down south by car or motorbike, at flying speed using the international airports of Pescara or Bari. The last part must be done by local transport! Travelling the whole way by train is possibile because a local railway brings you to San Menaio just downhill from Casa Il Cantico! All possibilities are described on this page. After booking your holiday you can get a detailed map with which it will be easy to find us. For the owners of a small caravan or camper a special map is available. The normal route is not suitable even for the smallest caravans and campers. The use of all types of transport and camping is always at your own risk. The management cannot be hold responsibile for any damage on the road or at the campsite. You'll find IL CANTICO by travelling along the eastcoast of Italy till you reach the regio Puglia. 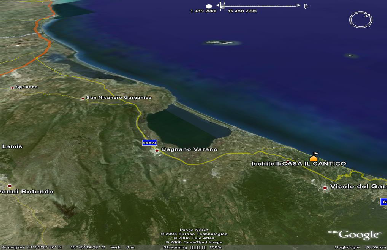 South of Termoli the Gargano is situated as a penninsula in the Adriatic Sea. You take the junction Poggio Imperiale from the motorway A14 and following the SS693 superstrada and the SS89 for about 55 kms towards the old coastal city of Rodi Garganico. You 'll reach CASA IL CANTICO just between Rodi and San Menaio, a 1200 meters land inwards. Close by international airports are Pescara and Bari. Some low-budget airlines provide regulair flights from Germany, Belgium and even the UK. You can also fly to Naples take a crossroad eastwards through the peninsula of Italy. It’s highly recommended by some of our guests who did it! CASA IL CANTICO can be reached by train. A local railway brings you from San Severo to San Menaio at 3,5 kms from the CASA. San Severo is a railway station on the landwide railway network. And how far do you have to travel in Europe? From Calais, the european gateway, to Casa Il Cantico it is about 1865 km by road.